I used the Stampin' Up Loads of Love stamp set to create this year's Father's Day card for my dad in Texas. I also made a similar card for dear hubby. The wide open images of this stamp set lend well to shading and coloring with alcohol markers. I also made a more general card with a tag, Loads of Love. I liked the way the DCWV patterned paper sort of looks like a highway with another piece resembling the trees! Let's face it . . . I need another stamp like I need a hole in the head! However, being addicted to stamps, this set of four English cottages by Crafty Individuals was more than I could resist. After an idyllic visit to Shere in Surrey, just a stone's throw away from our home, I came away with lots of inspiration on making these cards. Shere, which has been used for a handful of film sets (including The Holiday), feels like a village stuck in time with charming cottages, traditional pubs and tea rooms, and majestic old church. I began by stamping the cottage stamps onto Whisper White card stock and then coloring with alcohol markers. 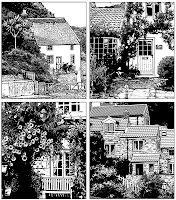 The look was still too stark for this nostalgic design, so I put the cottages onto thin cardboard, gluing them down and then glazing them with an antique decoupage finish. The cards were enhanced with shimmery brown ribbon. But the crowning glory were some vintage buttons, which I procured from a fellow artisan (Creative Crucible) selling her wares in Shere at a village fair. I love buttons, and I find each one a treasure that has its own story and can complete a craft project that is otherwise lacking.